One of the most challenging exhibitions that I’ve recently seen in London was mounted at Raven Row over the summer, an independent foundation based in one of London’s oldest, surviving shops in Spitalfields. The starting point for the show can be summed up by the phrase coined by Miles Davis to ‘play what’s not there’. This impossible act became a metaphor for a larger enquiry around existential expression in art. Curator, Michael Bracewell, chose to explore artists working beyond Soren Kierkegaard’s description of ‘the despair of the aesthetic’, those infinite and potentially paralysing creative decisions, in order to achieve something more profound and ‘spiritual’. It is a highly romantic notion of artists as visionary and medium, compelled to reach for ‘truth’ despite the cost and then to share knowledge with those who choose a safer, more prosaic route. In a succinct essay, Bracewell examines Kierkegaard’s philosophical quest for meaning in life. To illustrate the theme, he chose an eclectic number of works dating from the 1960s. You needn’t have shared Kierkegaard’s religious or intellectual interests to enjoy the show. The works ranged from Linder’s ‘The Working Class Goes to Paradise’, a trance-like performance in a Manchester nightclub to Edward Krasinki’s consciously awkward constructions in wood and wire. Cerith Wyn Evans’ Leaning Horizons, two upright rods leaning against the wall were neon illuminations embodying geometry, weight and gravity while standing as cocky intrusions in the room. Most of the pieces in the show were isolated within dedicated rooms. 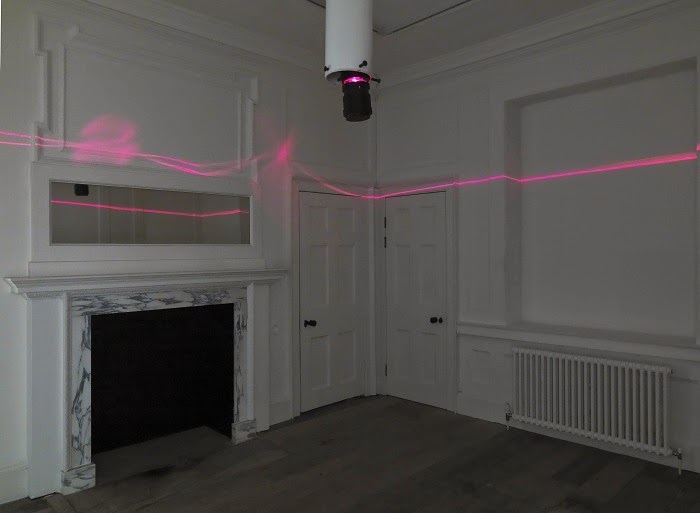 This was appropriate for Robert Whitman’s Wavy Red Line, a laser powered projection of flickering, red lines that traced the proportions of an 18th century panelled room. The future incongruously met the past here. Perhaps the work that most addressed the notion of boundaries and transitions in comprehension was Bruce Nauman’s infamous ‘Clown Torture’ a pair of video works illustrating psychic confusion whereby a two characters dressed as clowns neurotically speak plaintive chants, which are later contradicted. He stages two fictional characters performing statements that might be factual or imagined, demonstrating the fine line between certainty and doubt and what lies between them. It’s those ambiguous, narrow spaces in language or materials that open up new meaning and knowledge.